Eat on $30 day 5. Last day to enter for the Macy’s gift card giveaway! Remember when I started the Eat on $30 challenge and I mentioned a local spice shop? Several friends of mine had recommended it to me before, but I never set foot in the store until last week. In need of small quantities of nutmeg, cinnamon, and whole star anise for Eat on $30 (because I couldn’t afford whole jars in the grocery store), my brain did me a solid and remembered Savory Spice Shop on Broadway just north of Pearl Street. I was greeted by the warm smell of spices on the air and a very friendly and knowledgeable staff. For my immediate needs, Savory Spice Shop worked. The minimum amount you can buy is a half ounce of any spice or seasoning. That cost me $3.45 for the ground cinnamon, ground nutmeg, and star anise pieces. If you have ever had to purchase spices in an “emergency” at a typical grocery store, you know they are not only inferior in quality, but really bloody expensive. I only needed a half teaspoon or a quarter teaspoon, but since I had extra, the cinnamon and nutmeg have livened up my otherwise lifeless oatmeal during this week’s challenge and they came into play for a last minute snap of brilliance on day 4 (see after the jump, yo). Savory Spice Shop is a local business. It started in Denver about 5 years ago and has expanded to a few other locations in Colorado, including (thankfully!) Boulder. 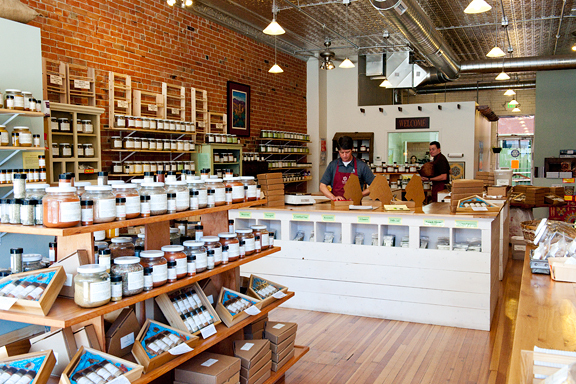 Dan Hayward is the owner of the Boulder store and explained that their spices are ground on the premises each week to ensure freshness and the highest quality. They do more than just sell spices and seasonings – every person working in the store has a personal love of things culinary as well as professional ties to the culinary industry (one employee is a chef). They are constantly educating themselves on food. That is a welcome change for someone who is passionate (and a little OCD) about her food. I’d much rather ask an employee of Savory Spice Shop about the spices I want to purchase than *anyone* working my local grocery store. Know what I mean? The Eat on $30 challenge aside, I know I will be coming back to Savory Spice Shop from now on. I spied vanilla beans, extracts, kaffir lime leaves, several types of dried mushrooms, rubs, seasonings, just to name a few. They also have several smartly packaged gift sets throughout the store. Their prices are cheaper, the quality so much higher, the quantities more reasonable, and the selection is better than anything in town. And the added bonus is that I feel better purchasing from a local store than from a national chain. I’m a little giddy thinking about what I’m going to purchase there the next time when I’m not on the $30 restriction! Full Disclosure: I wrote this review of my own volition and without compensation in any form from Savory Spice Shop or Metroseen. 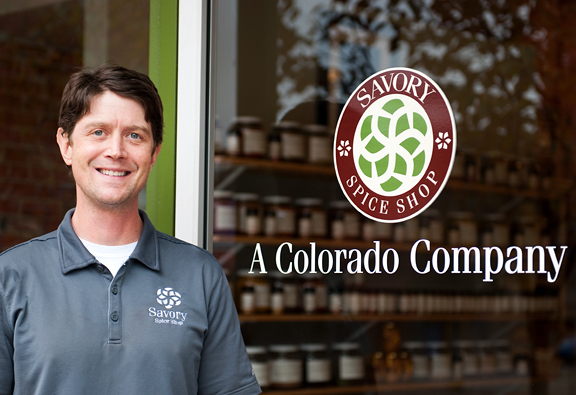 I just happen to love Savory Spice Shop and want to promote good local businesses in my area. Sarah is a former employee of Savory Spice Shop and she now works for the Culinary School of the Rockies where I took my pastry skills course and my knife skills class. [Remember how so many of you were squealing over Chef Michael, my knife skills instructor?? Uh huh…] Sarah writes their blogs (which I read) and manages most of the goings-on over at their office. Very cool. Lots of foodies. 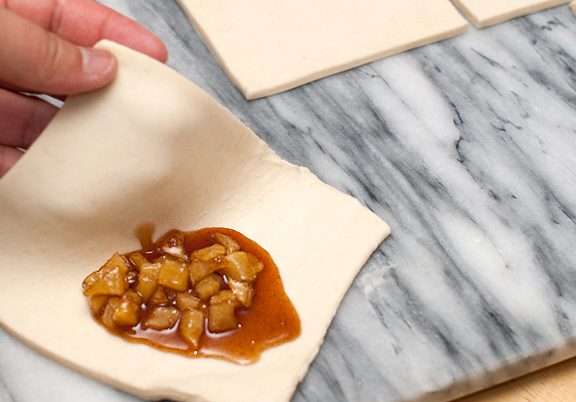 What’s with the apple turnovers, you ask? 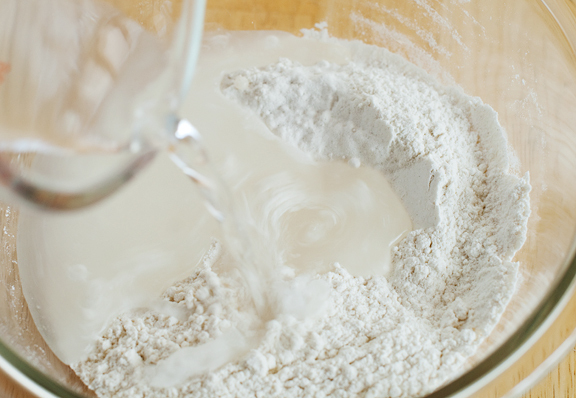 Funny thing… I weighed out 5 ounces of flour that was not designated for anything. Since I am a proud member of the Daring Bakers, I recalled last month’s challenge of puff pastry. It’s time and a tad labor intensive, but it requires, flour, butter, water, salt. I had those. I chopped up one of my apples and simmered it in butter, brown sugar, and cinnamon (oh, to use that lovely cinnamon from Savory Spice Shop – so glad I had extra) for the filling. I apologize for not having anything profound to share tonight. It’s late. I’m tired. May The Force be with you. I return to Boulder about once a year to visit family, so whenever I read/see one of your posts/pics about Boulder, I just want to take the next plane out. I love Boulder (just not in the winter) (yes, I am a wuss). Dear Jen, thank you for the information you’re sharing about the Eat on $30 Challenge. I’m learning lots from you & your followers. I’ve had subsequent conversations on this topic with friends and we are waking up. I’m retired & live in a building with several elderly folks. We’ve just been hit with a whopping special assessment with payments of one to two thousand $$ a month for 4 months. I’ve agonized over how some would afford this since I know there are folks trying to get by on SS alone and barely make it. They take out equity loans or reverse mortgages. Three days ago my neighbor let me know that she’d taken on the assessment challenge by NOT taking out a loan but rather cutting back drastically on all expenses for the 4 months. She said she ate two meals a day and one of them was oatmeal. She showed me her cupboard and refrigerator and they were very sparsely populated with food supplies. She’s lost some weight but wasn’t too concerned. She looked a little frayed and not as vibrant as usual. I’m so concerned about the many hungry people. What must we do? Jen, Jen, Jen, I want to see lunch for Jen in the day’s schedule. Eat an apple, a banana, something. Busy cannot be an excuse. 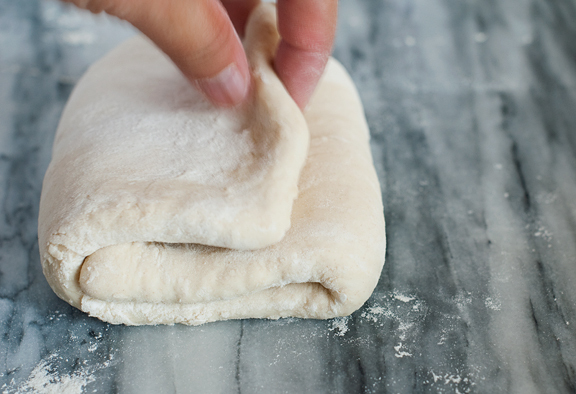 Since I’ve been chicken-heartedly putting off puff pastry for years, I had to laugh at how seemingly cavalierly you realized that you had the right ingredients & jumped in. The silky pastry in the 2nd to last shot, and of course the final shot, are sorely tempting me! I’m not doing your challenge, but have been doing a lot of freezer & pantry cooking this week as I haven’t had time to shop, and it’s very satisfying. Oh ho ho – it’s apple season! Those look amazing! I always drool over the spice catalog when it comes, this store is even more amazing! And how fun to be able to buy small quantities to try new things (not to mention when you’re on the $30 challenge). I would love to go to a spice shop like that. What a wonderful resource for you! It’s also nice to know that you can run in and buy small amounts – pretty cool! 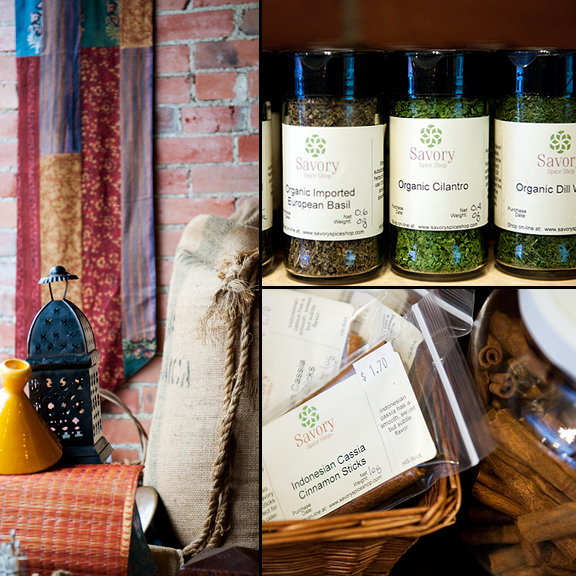 Savory is one of my absolutely favorite places to shop. I love walking in there and smelling whatever it is they are toasting that day… heaven! Hey! Cool that we have such a hidden gem so close to our ‘hood!! I can’t wait to stop in the next time I’m nearby! I always think it’s so stupid that the grocery stores sell such HUGE containers of spices…and spices lose so much flavor after just a few months, so you waste a ton of money. Congrats on the little media gig, there–how awesome for you! I’m envious!! Savory looks amazing and how wonderful to be able to buy small amounts. I have spices languishing away (and taking up valuable space) after having to purchase larger bottles. 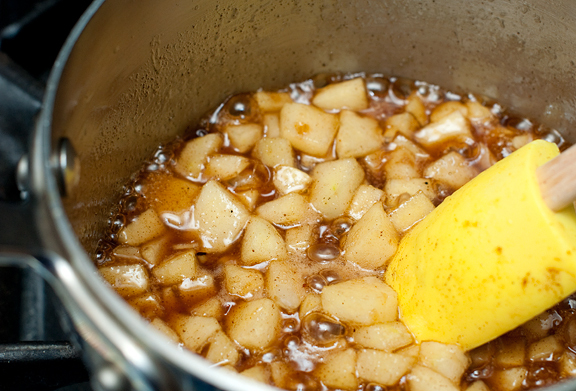 I could SMELL the cinnamon in that pot of apples cooking…have mercy! Gorgeous! I’m envious of your cooking skills! I often eat on very few dollars per week, but none of my meal seem to make as much sense as yours (merguez, zucchini and.. rice with nori seaweed???)! Also free samples are something that poorer neighborhoods don’t get as many of, even packets of mayonnaise that you can simply grab aren’t available in my neighborhood as people would take advantage of it. The Savory Spice Shop looks amazing! I wish I had a resource like that nearby. Thank you for the apple turnover recipe. Apple season is in full swing here, and I’m so enjoying baking with them. So, so cool– all of it! I wish Savory Spice was in Walnut Creek, CA. Wow! The photos are beautiful, as well as your descriptions of everything. Thanks so much, Jen, for coming out to help with the Metroseen.com video. It went well and we had a lot of fun. It was very serendipitous that you were already in the process of writing this when I approached you. There must be something buzzing in the air about Savory Spice! Jen, you are an amazing baker and photographer! 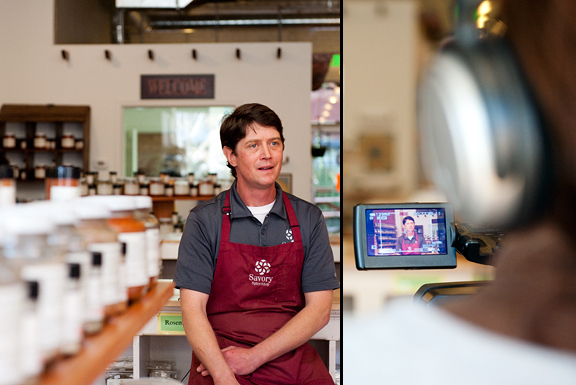 Thanks so much for featuring Culinary School of the Rockies. That shop reminds me of the Spice House. I am lucky to live like 2 blocks away from one of their locations in Chicago. Its awesome. Great photos. Sarah, you’re the best. Thanks, Jen, for honoring Culinary School of the Rockies and our favorite baker. I love this spice shop! I shopped here during my last trip to Boulder. They have some of the freshest smelling spices I have found. I love their chili powder and fajita blends! Great post! I love SS, and visit the Lowry shop at least monthly. My favorites are the Mt. Olympus and Platte Park seasoning packs. I also love their freeze-dried shallots, which I put in my scrambled eggs. Ooh, and their Mexican cocoa mix is to die for. One of these months I’m going to pitch my old, stale jars of spices (I have a literal tub of oregano from Costco–what was I thinking?) and go wild at Savory Spice. What a great idea shopping for spices in bulk. I’m always amazed by how expensive a jar of spice is in a grocery store. 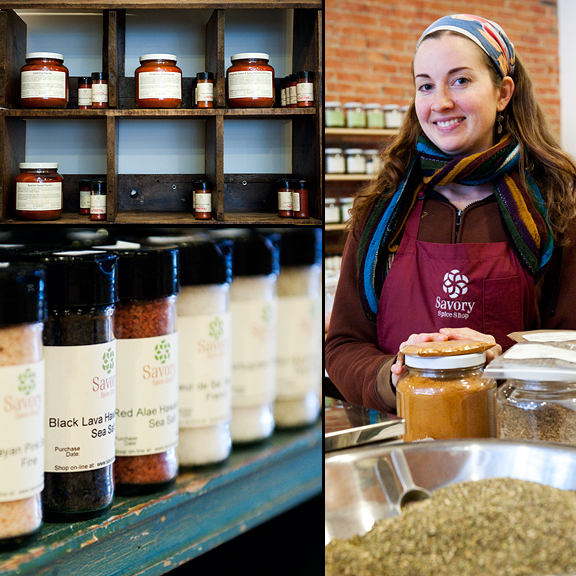 I love the Savory Spice Shop and get all my chai ingredients there for holiday gift giving and wintertime sipping! Yum! 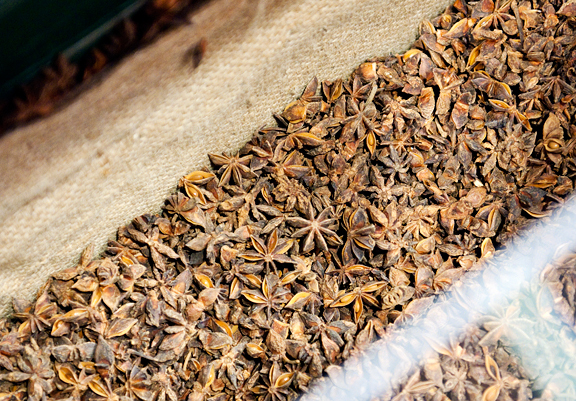 Fresh spices can’t be beat. But I do want to turn you onto a couple other resources for bulk herbs and spices — Whole Foods and Safeway (maybe King Soopers, too) have bulk spices and herbs! I just recently noticed Safeway in North Boulder had them in the “natural foods” area of the store. Of course, Whole Foods has a great selection, too. The good thing about these sources is that you absolutely CAN buy a half teaspoon of something, if that’s all you need. You’ll pay pennies for it, and that’s awesome, if you’re trying to eat on a strict budget. I’m old enough to remember the first food coop in Boulder, on 14th Street, just north of Arapahoe (across from the gun shop, of all things!). We sold bulk spices, there. When we went out of business, and everything was half price, my friend came in and bought this amazing amount of saffron for a song. It was brilliant of her to think of doing that, and she made Indian food for years, flavored with that stash. Anyway, love your blog. 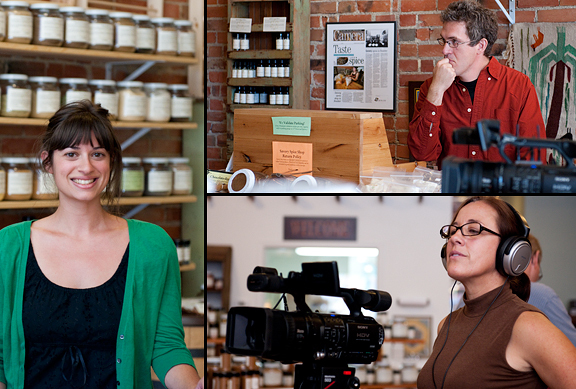 Fun to read your Boulder culinary adventures and see your local pics. 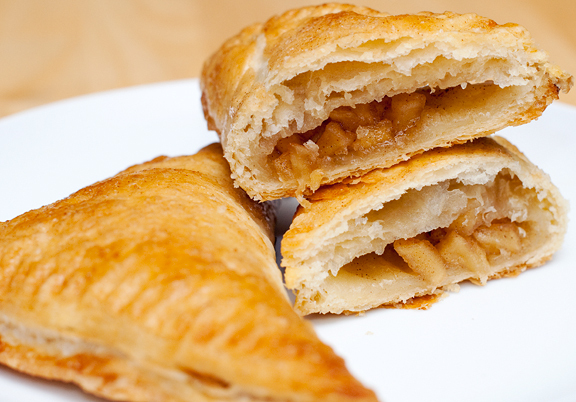 The apple turnovers look amazing! BTW, your “good morning” tweets always put a smile on my face. Have a great weekend. I am a spice addict, so i’d love to visit that great store! 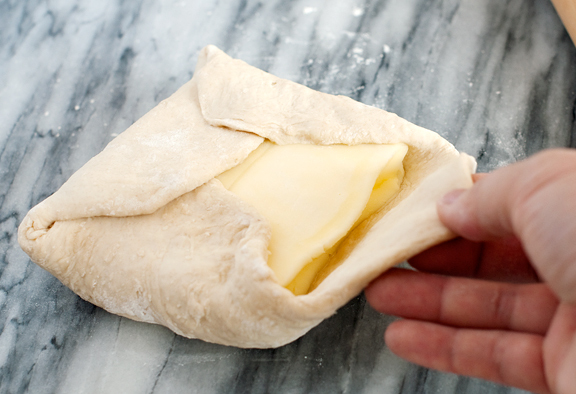 Great posts eating on your budget and it’s amazing you decided to “whip up” a little improptu puff pastry for your turnovers! Go girl! I love Savory! I went to one in Denver earlier this year. I love the Hudson Bay Beef Spice blend. Although I’ve never had it on beef. My mother loves it on Salmon. I LOVE it on fried eggs. Delicious! I need to reorder soon. emhuze – that is a very tough situation, but it sounds like working together you may be able to find a solution. Many people have said that pooling resources together to feed several people is more economical. TKW – yes, let’s go sometime! Kimberly – it’s true, he’s such a delightful and pleasant fellow. Mark – thanks for having me. Sarah – totally my pleasure. Joan – Sarah is awesome :) I love CSR! Lynn – ha ha! I can see it too – it’s like a cook’s amusement park! BldrJanet – yup, I thought about that but none of them had whole star anise and really, I wanted to check out Savory Spice Shop for a few months now, so it made sense to just go and check them out. Thanks for the tip regarding the spice shop! I’ve always walked by, looking for an excuse to go in…and you finally gave me one. I collected up fantastic spices for a Tikka Masala, and it was delicious. The people at the store were friendly and knowledgeable, and I immediately started looking for reasons to return. I’m also thrilled that you featured the small Asian grocer in your latest post! Love that place.